Several things come to mind when one hears "BAALS." Fort Wayne residents may recall the famed mayor Harry William Baals who served 3.5 terms (the longest serving mayor of the Fort thus far) before passing away while in office, May 1954, or perhaps the commemorative plaque under the Calhoun Street bridge or even the H.W. Baals Drive through Johnny Appleseed Park. The rest of the nation most likely recalls the Jimmy Kimmel skits mocking both the city of Fort Wayne, and the revered mayor Baals. Harry Baals even made the number one spot on Google's Hot Topics list in February 2011. The attention was sparked when thousands of people voted online to name the new city-county building in his honor. Although officials of the city rejected the idea in lieu of Citizens Square, Kimmel caught on to the story and would not let it rest, along with syndicated radio and other late night hosts, the national recognition was largely derisive. This is exactly why the founders of local nonprofit A Better Fort wanted to take Baals by the horn and reinvent the perception of the underlying and symbolic meaning. "The objective is to take negative stereotypes and rhetoric, poke fun at them and embrace them, as something of the past and make it clear that this is a new day for Fort Wayne," the official statement reads. "And to show the world that this city, in fact, has #Baals." Two of them, to be exact. In response to outstanding support and the overwhelming popularity of the past two events, the third annual block party has blossomed into a downtown party series. The first party of the pair of #Baals will take place in front of Pint & Slice and the Dash-In on South Calhoun Street on July 11th, and the second will be August 1st at Columbia Street on the Landing. Both events run from 6:00 - 12:00 pm with $5 admission, kids under 12 enter free. While the event features a rave-like atmosphere with Fort Wayne's own electronic DJs, dollar beer and glow sticks, families are welcome and usually can be seen until about 8:30. After that however, the music really kicks up. Electronic dance music and Fort Wayne do not immediately spring to mind as the most cohesive bedfellows; and yet 2,000 and 3,000 people, in 2012 and 2013 respectively, all convened on the 800 block of South Calhoun Street to celebrate both the music and the city. Indianapolis can have difficulty at times reaching those kinds of numbers for lesser known acts, it is truly incredible that local Fort Wayne DJs can gather such a huge home-based audience. In cooperation with VoxPop Communications, the word has been spread even farther this year. To date, the #BaaLs event on Facebook has 1.1K guests planning on attending, a 68% increase from last year. Early estimates for #BaaLs 2014 place attendance at 5,000, and while we will have to wait to know for sure, one thing is certain, the people of Fort Wayne are ready to rumble and hungry for fun. Still, there are many questions left unanswered. In order to delve a little deeper into the significance behind the #Baals, we spoke to A Better Fort's Vice President of Operations, Shane Araujo. A Fort Wayne native, Shane was recognized as one of Greater Fort Wayne Business Weekly’s 40 Under 40 in 2013 and was the chief instigator behind the block party inception. Das Fort (DF): What question are you tired of being asked about this event? Shane Araujo (SA): "What does #BAALS mean? This is partially a communication error and we need to do a better job articulating this on our website. We plan to do this before the first event on FRIDAY." DF: What is something that the public most likely does not know about the behind the scenes efforts? SA: "To date, the event is 100% planned and executed utilizing volunteer efforts. Not one person has been paid … a true collaborative effort. However, we plan to hire a part-time event coordinator to help grow the event. It is not sustainable to do so off JUST the efforts of volunteered hours." DF: Can you share any insights on how this event got started? SA: "As one of the co-founders of A Better Fort, I brought the concept to the table and we voted to make it a reality in the spring of 2012. The venture was up and running before the BAALS pun that was made famous by Jimmy Kimmel, and was done under the alias: #House4aHouse. After deciding that we'd like to see this concert series become a 'staple event' here in Fort Wayne, we knew we had to create a more scalable name. 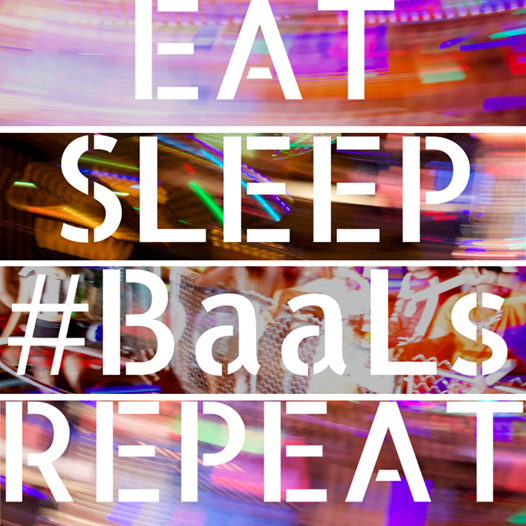 #BAALS seemed appropriate because rather than hide beneath the negative rhetoric and ridicule we've endured in the past (Fattest City, Dumbest City, Most Boring City, Known for Harry Baals, etc) we wanted to take a piece of that, and turn it upside down. #BAALS seemed appropriate for doing so …"
DF: What was some of the feedback that you received and have put to work for this year's block party? SA: "The typical main points that come with managing a large scale social gathering, such as MORE bathrooms and shorter lines. However, the biggest request was MORE! The general public wanted MORE than just that night … so we gave them what they wanted and this year we are doing a 2-part concert series on July 11 and August 1." DF: Are there any obstacles you've had to overcome in order to get this event running? SA: "Doing a lot with a little (actually with nothing). We have no funding and no one being paid part or full-time. Thus we've made up for this with passion and creative sponsorship options where businesses can find equal value exchange. This year O'Daniel Mazda came in huge with their headlining sponsor spot. It's business owners like Randy O'Daniel, A Better Fort volunteers and key coordinators that are truly passionate about an active central city and A Better Fort being a part of that momentum." Starting at 6 sharp, guests will trickle down the "media walk" on a red carpet and be photographed by professional photographers. O'Daniel Mazda, one of the primary sponsors, took the opportunity not only to team up with A Better Fort to help with the revitalization of the city center, but also as a chance to reach the masses with their "No Text and Drive Campaign." Supporters can take the official pledge to drive safe at both parties. Other sponsors include: Visit Fort Wayne, Greater Fort Wayne Inc, VoxPop, Sweetwater Sound, Gleave Construction, and INRUSH bicycles. A Better Fort provides positive life experiences that make a difference in the lives of individuals within our city. To learn more about A Better Fort, visit their website.